Available since 2008 I have been remiss by not reviewing this AM/FM all-analog portable earlier. No sooner had I posted my review of the Sony ICF-38 than readers began asking me how it compares with the R-308 so I will cover that in this review as well. 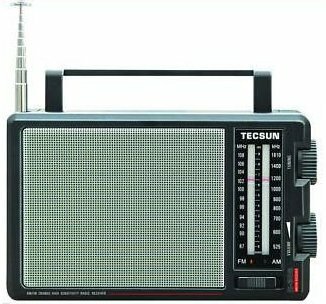 The Tecsun R-308 is a handsome, classic-style analog AM/FM portable with a vertical sliderule dial. It is advertised as a “big speaker” radio and indeed its grille emphasizes the amount of space the speaker occupies in the radio…actually the speaker is 4″ so it’s not quite as large as the grill might lead you to believe…still, 4″ is a respectable size in today’s market and at this price. The radio feels heavy and solid…not cheap and flimsy like so many current products. It measures approximately 9″ x 5 1/2″ x 2″ and weighs about 2 pounds with three alkaline D cells in place. In many ways the basic design harks back to the heyday of portable AM/FM radios…this is a nice looking set. Pricing however is all over the place on the R-308. One of the high profile Chinese eBay sellers currently offers it for $18.99 plus $17.50 shipping for a total landed price of $36.49 and several mail-order sites have it at a similar price. However some sites have the price inflated to more than double that so shop carefully. At under $40 the Tecsun is a good value…at $70 or more it is not. 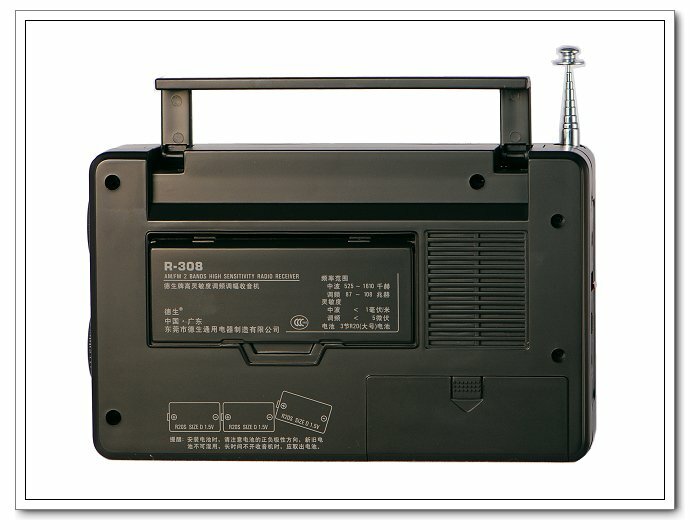 The radio features an antenna jack for FM, an stereo earphone jack and external 4 1/2 volt DC input jack although you have to supply your own wall-wart adapter for it. Frequency coverage is FM 87-108 MHz and AM 525-1610 KHz…no expanded AM band coverage is claimed although my sample tops out at about 1670 KHz. The radio runs on 3 D cells which last a very long time in typical use and the amplifier puts out a hefty 500 mw of power. Controls are as basic as can be – a slide On/Off switch, volume and tuning knobs, an FM/AM switch and a tone control slider which is actually a bass control rather than the usual treble control…I tend to leave it at maximum bass (lowest position physically) most of the time. The sound is pleasant although not spectacular. On both AM and FM the sound is honest and natural even if not in the same league as some better sounding/more expensive radios. The only complaint I have is tuning backlash and tightness…many users report this so I don’t think my sample is unusual. It is a minor annoyance, making it just a little tougher to tune it precisely until you get the knack of it. AM and FM reception is good for this price range…it is reasonably sensitive and selective on both bands. It does not compare with the best portables but for the price of admission it’s not bad and as always, a loop helps AM tremendously. Dial calibration is good on my sample. Comparison With The Sony ICF-38: These two radios are similarly priced although the Sony is distributed more widely than the Tecsun…I found my Sony on Amazon for $29.99 with free shipping. The Sony is slightly (and I do mean SLIGHTLY) more sensitive on AM on a direct side-by-side comparison…I doubt most users would notice the difference. On the other hand the Tecsun is a bit more selective on FM…it separated some weak out of town signals which I could not receive on the Sony. Unfortunately the Tecsun’s FM rod antenna does not tilt or swivel so fine adjustments for problem signals aren’t possible..an odd omission. The Sony’s sound is slightly richer than the Tecsun’s (big speaker advertising notwithstanding) – the Sony is not only clearer in the midrange but has a bit more bass and treble. Again, the Tecsun sounds fine on its own but on a side-by-side comparison several people commented that they slightly preferred the sound of the Sony. One more pro and con: The Sony has a built-in ac cord with no wall-wart needed…the Tecsun can use a wall-wart but does not come with one. On the other hand the Tecsun’s three D cells will far outlast the Sony’s 4 AA cells so again, it depends on your mode of use which might best suit you. 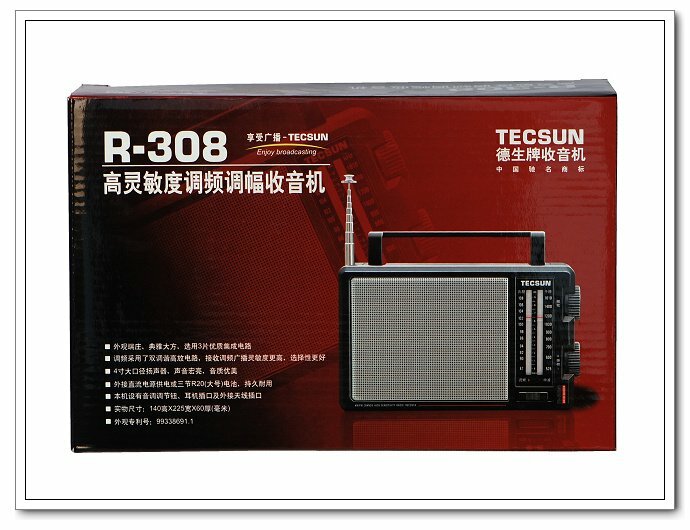 Bottom Line: The Tecsun R-308 is a good, inexpensive AM/FM portable. Shop carefully as the price varies widely. For any non-critical use it is hard to fault and would be a great companion for camping, the beach or just around the house and yard. 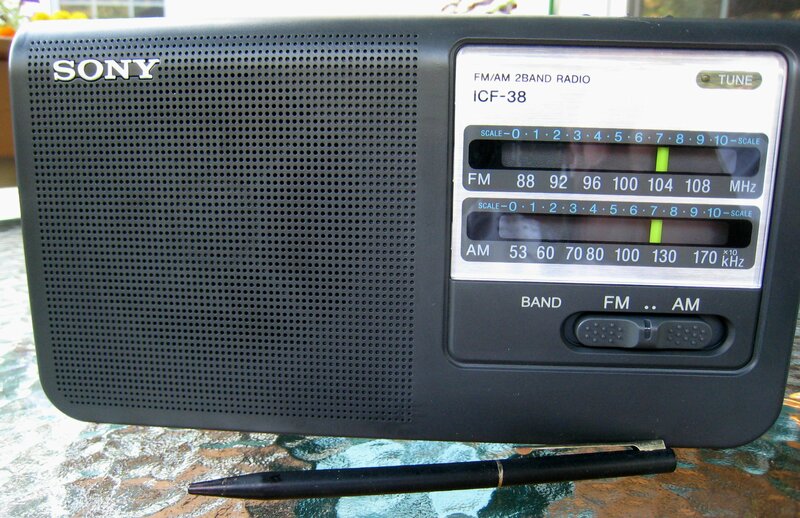 The Sony ICF-38 is easier to find and is at least as good as the Tecsun on AM but for FM lovers the Tecsun will hear some signals the Sony won’t.